After a 12:05 AM showing, excited fans of The Dark Knight saga were met with tear gas, gunshots, and terror. 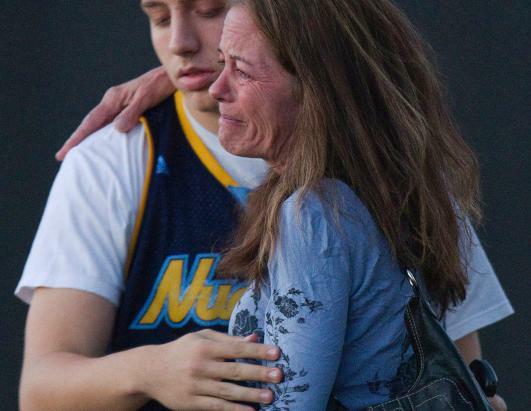 Jacob Stevens, 18, hugs his mother Tammi Stevens after being interview by police outside Gateway High School where witness were brought for questioning after a shooting at a movie theater, July 20, 2012 in Denver. (Barry Gutierrez/AP Photo). Image courtesy of ABC news. Its horrifying to think that such atrocities are still as rampant as they are today, and what probably scares me most is that man of these fans are my age. I am also a huge fan of The Dark Knight; I waited in line for the midnight screening at a Jordan’s Furniture Imax theater in MA when I was in high school. Not only that, but I was so in love with it that I scrambled to find tickets to the sequel film (though not at a premiere). When I think of terrorist attacks, violent shootings, or other major news, I think of major cities and high-profile school campuses: the 9/11 attack in New York City when I was in middle school, the Virginia Tech shooting as I was visiting college campuses as a junior, and the violence towards Occupy protestors at UC Davis. No one expects a little boy buying skittles to get gunned down on his way home anymore they expect a 24-year old to throw tear gas and gun down 12 people in the morning. And whats even more terrifying to me, is that the assailant was only 24; I’m 22. A lone gunman my age, who has witnessed all the same acts of atrocity that I have, and is still compelled to commit such an act of violence is scary to me. One witness, recounted that he looked ‘calm’ as he committed these acts. Both Obama and Romney released statements promising to reach out to the families of victims in Aurora, and Obama has cut his campaign short to address the violence more directly. My thoughts and prayers go out to Aurora, Colorado.